The Douglas-fir tree's root system consists of a strong taproot, secondary supporting taproots, lateral roots and fine roots. While the majority of the root system is densely packed near the stem of the tree, roots may extend as much as 10 feet vertically and horizontally from the tree base. Generally, the size of the root ball relates to the size of the tree crown; however, soil type can influence the lateral spread of roots. Douglas-fir trees initially develop a strong taproot, which rapidly grows downward and anchors the species to the ground. Lateral branches, which branch off taproots and help to stabilize the tree, begin to develop after the first or second growing season. Numerous, short-lived fine roots develop along small lateral roots. Fine roots are less than 0.2 inches in diameter and are concentrated in the upper 8 inches of soil. The Douglas-fir tree experiences a slow vertical growth the first decade after planting. Throughout this time, the majority of growth takes place under the soil in the root system. Overall root biomass decreases as Douglas-fir trees age. The symmetry of root systems likely will become distorted by changes in the slope and the presence of other roots. In general, trees closely planted to one another tend to interconnect and graft over time. Soil type and quality affects the development of the Douglas-Fir's root system. Roots grow and spread faster in deep, well-drained soil with limited obstructions, such as rocks. In this preferred soil type, taproots can reach up to 90 percent of their overall height in the first six to eight years following planting. Plate-like root systems that can get knocked over easily tend to form in shallow soils with a high water table. Windthrow refers to the complete uprooting of trees from strong winds. All species of conifers are vulnerable to damage from windthrow. 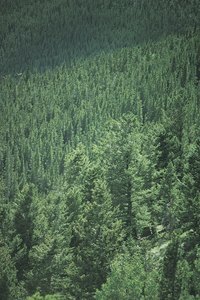 The Douglas-fir--particularly the coastal variety--is able to withstand windthrow better than most commercial conifers because of its favorable ratio of height to width. Trees grown in dense stands that suddenly become exposed to wind are less stable than open stands of trees that consistently are exposed to winds. Overall, windthrow occurs the most in poorly drained soils where rooting depth and growth are restricted. USDA Forest Service; Douglas-Fir; Richard K. Hermann, et al.